The FHM is located in the old post office of the former town of Hespeler at 74 Queen Street East, Cambridge, Ontario, and can be reached from the 401 via the Townline or Hespeler road exits. Starting July 1, the museum will be open regular hours Wednesday – Sunday, noon to 5 p.m. Tours can be booked by appointment. Our opening exhibition in gallery one ‘Treasures from the Collection’ will feature some of the rarest and most interesting pieces from the collection including: what may be the oldest extant European-made shoe worn in North America, a paper corset, and a suit designed for Eva Peron. In gallery two ‘Back to the Eighties’ looks at the fashions from that decade through specific themes such as glamour, power, shock, innovation, and romance. Both these exhibitions will remain until the end of the year. Until August 2 gallery three will host ‘What to do with an Old Post Office’, a display of the winning boards from the Construction Specifications Canada student design competition this past winter. Our building was a case study for students to design projects repurposing the structure. The winning ideas ranged from a day spa to a museum for comics! Opening August 5, Gallery Three will showcase ‘Punks and Posers: Portraits from New York and London’, a photographic exhibition of 1980s street photography. This exhibition will coincide with the launch of our Fashion Film Fridays on August 7. Every Friday evening at 7 p.m. from August 7 – November 20, the museum will host a fashion-essential film from the 1980s. The films will include: Pretty in Pink; Earth Girls are Easy; Flashdance; Slaves of New York; Ruthless People, and Desperately Seeking Susan. As you may have noticed, our website has not changed for a few months. We were hacked last year and lost our calendar update. However, we are endeavouring to launch a new website with a new look just in time for the opening. 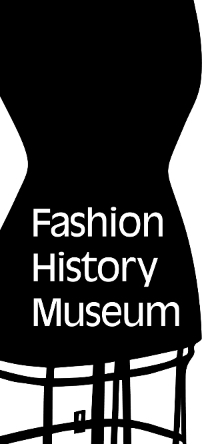 In the meantime, don’t forget to check out the Fashion History Museum on Facebook. We post an artifact of the week every Monday as well as updates on the progress of the museum and any relevant information about FHM events. And don’t forget to ‘like’ us when you are on facebook! Anyone can become a fan by signing up for the quarterly newsletter – and it’s free! If you are reading this, you probably already are a fan – spread the word. For an annual contribution of $40.00 ($25.00 for students), you will receive the quarterly newsletter as well as one copy of the annual FHM journal (distributed in September), access to the FHM research library and archives (by appointment), advance notification of museum programs and events, invitation to all curator lead exhibition preview tours, and a 10% discount on all FHM gift shop and bookstore purchases. For an annual contribution of $200.00, garter level benefits are expanded to include six passes to museum events, invitations to all exhibition previews, and priority ticketing for all events and programs. The Blue Stocking club is invited to meet guest speakers at receptions and attend an annual cocktail party every September. The Blue Stocking club level is also eligible to rent the museum for private events. Tailored for your level of support – along with all other benefit levels, couture donors will be invited to an annual curator’s dinner, as well as receive a tax receipt for their annual contribution for any amount that exceeds $250.00. Name is added on the annual donor recognition list unless donor wishes to remain anonymous. “Africa Lion Safari” said the road sign… At 7:45 am the place was empty – no-one around… in a couple minutes a friendly fellow came up and gave us directions. We had to fill some forms and sign it – so just in case if we are eaten by the lions the park is not responsible (no kidding!). The bus was very comfortable with large windows and choice of seats! We are going to feed the animals! Well, we will first see the cheetahs and lions, so we can’t really feed them – just watch! Thus the forms and the bus – all to make sure we behave and well protected. Cheetahs are living in groups usually formed by siblings – we saw four brothers playing and enjoying the morning. Their neighbour was the single male cheetah, in the next area we saw couple others… They live in a fenced area, so that the groups do not interfere. Cheetahs are territorial and will fight for their area. They are the fastest runners and can develop the speed up to 76 kph. They got nice spotty coats that help them hide and strong lean bodies with long legs. Very gracious animals! We are driving to the lion’s area! The keepers put pieces of good (AAA!) meat in different spots around large area. Lion can eat about 7 lbs of meat once a day, usually in the morning. They will play and nap during the day… morning is the most active time of the day. So here is the signal – all ready, lions are coming! First we see two of them… they come at a slow pace knowing that the food is waiting for them… here is a large male lion – his mane makes him look really big and powerful. It takes five years for the mane to grow to its full size. Females also look really strong – large paws, strong neck and gracious body. They quickly found the meat and picked each a good piece… not without a fight for same piece of meat. Their canines are about two inches and the tongues are really rough – they can clean the meat off the bone like sandpaper! In wild, males do not hunt – they protect the group while lionesses are hunting; they can kill an animal three times their size. We leave the lions and go to the next area, but before we change the vehicle – now we are in the open trailer and we got two buckets – one filled with carrots and the other with fresh lettuce – we are going to feed giraffes! It was a chilly day with periods of rain and some wind… may be the cooler weather made animals more active? Giraffes were wandering around and slowly approached the truck as soon as we stopped. “Take a carrot in your hand and stretch the hand out… do not pat them, they get scared and can go away” – we were told by one of our guides. Baby giraffes can only eat lettuce – their teeth are not strong enough… That was a lot of fun! Feeding carrots to giraffes! And that is what we did for the next hour or so until our buckets got empty! Their tongues are purple and can reach 20 cm. Giraffes like to eat juicy leaves from the trees and for this their tongues can twist around the branch and strip off the leaves. They did it with carrots twisting their tongues around if we hold it a bit away sort-of teasing. Next to giraffes area we saw rhinos and antelopes: some grazing and some wandering around. Rhinos eat really fast – they are constantly chewing, the grass there is so short… they look fat, but is their skin that makes folds on their backs, not fat. Rhinos like to lay in a mud, it helps them to keep the insects away. Their spine is very fragile, so have to lay on one side then another. Their friend is a small bird that usually follows rhino picking bugs from its skin. The bird alarms rhino in case of any danger – rhinos got weak small eyes and can’t see well so if the birds fly up it alarms rhino. Antelopes were grazing peacefully… some had very long twisted horns. The antelopes got a very interesting body system allowing them to adjust to the high Africa temperatures. The body temperature can rise up to 40C, which allows them to control perspiration and avoid dehydration. We also saw some zebras walking around; they nicely get along with antelopes, giraffes and rhinos sharing a large pasture. We saw pile of rocks in a middle of the field – artificially created to reflect the natural habitat. Giraffes saw our truck and came again for more carrots and lettuce! It was time to go back! We were ready for our breakfast – it was waiting for us in the restaurant. Nice pastries, fruit, juice and warm waffles with whipped cream – all was beautifully served to us. Later on we went to explore the rest of the park. We saw elephants swim in the pond, took a tour on the boat around the islands with various types of monkeys, saw parrots and bats. I never saw a bat so close! It was hanging from the keepers arm and eating some fruit. Their digestive system allows swallowing food while handing. Their wings have a unique ability to repair it if they get a small damage quite fast. Next we saw a show where parrots could sort out colours, say some words and one by the name Fernando could sing “O’Canada!”. After a long day we were finally back to Hamilton Sheraton.. It was nice to relax in the swimming pool after the rainy day filled with fun and full of unexpected.